of your stuffed animal collection or your horse collection. This sweet pinto will keep you company on your bed or couch. It is slightly under-stuffed to make it just a little bit floppy for extra cuddling comfort. It is also 22" long from hoof to tail and comes with its own bridle and reins. 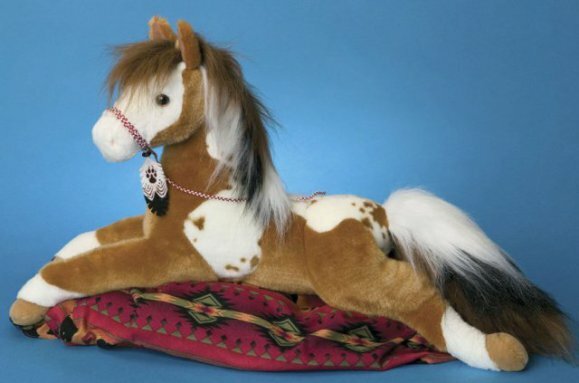 A cute feather accent on the bridle gives a Native American feel to this adorable plush toy. To order Cloud Dancer for yourself or your favorite horse-loving child, click here.